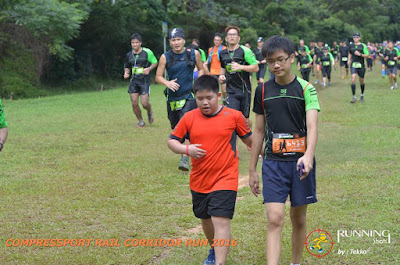 I didn't really enjoy the Green Corridor Run last year. It was hot because of the late morning start and the route was boring. 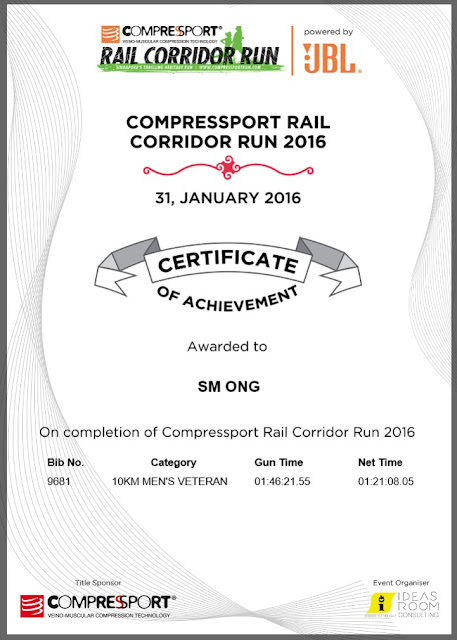 But I decided to join the Compressport Rail Corridor Run yesterday because it's a different organiser and instead of starting at the old Tanjong Pagar Station like the Green Corridor Run, it ended at the old Tanjong Pagar Station. The Rail Corridor Run started at the disused Bukit Timah Station, which is more accessible now, thanks to the newly-opened nearby King Albert Park MRT station on the Downtown line. Flag-off time was 9am, but it was a cloudy morning, so it wasn't as hot as I anticipated. What perfect conditions for a run. Or so I thought. 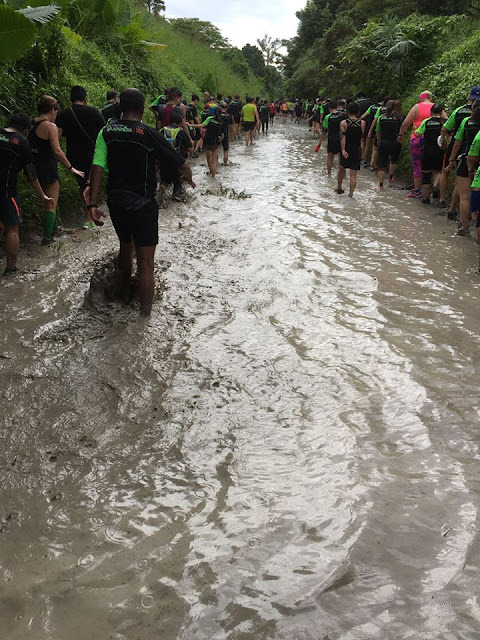 Within metres of the starting line, the runners encountered the first of what turned out to be many patches of mud along the 10km route. Everyone had to slow down to walk around the mud. I thought I could be a hero and run through the mud like any self-respecting trail runner, but it was too slippery. I also felt my shoes coming loose in the mud. How embarrassing would it be if one of my shoes came off after getting stuck in the mud? If I had known about the mud, I would've worn different shoes, like my snug Salomon S-Lab XT6 instead of my Altra Superior, with which I already had a minor heel slippage problem. I felt sorry for people wearing really nice shoes for the run, like Nike Flyknits, which aren't meant for trail-running in the first place. I don't know how the Flyknits were going to survive the mud. And just when you thought it couldn't get any worse, at around the 6km mark after a bridge, there was a huge pool of water covering the path. It was basically flooded. People were lining up to climb over the slope to the sides to avoid the giant puddle. What started as a trail run had become an obstacle course. That was when I decided to screw it and just waded into the muddy water. My shoes were already muddy anyway. It was time to go all in. What surprised me about the mud was how much it stank. I'm used to running in puddles in the rain around MacRitchie Reservoir, but it was never like this. I would've preferred the hot weather over the mud. There was no way anyone could achieve their personal best times in these conditions. So it was a bigger relief than usual to see the finish line at Tanjong Pagar Station. There were long queues of runners waiting to wash their shoes at the washing area. Yeah, good luck with those Flyknits. 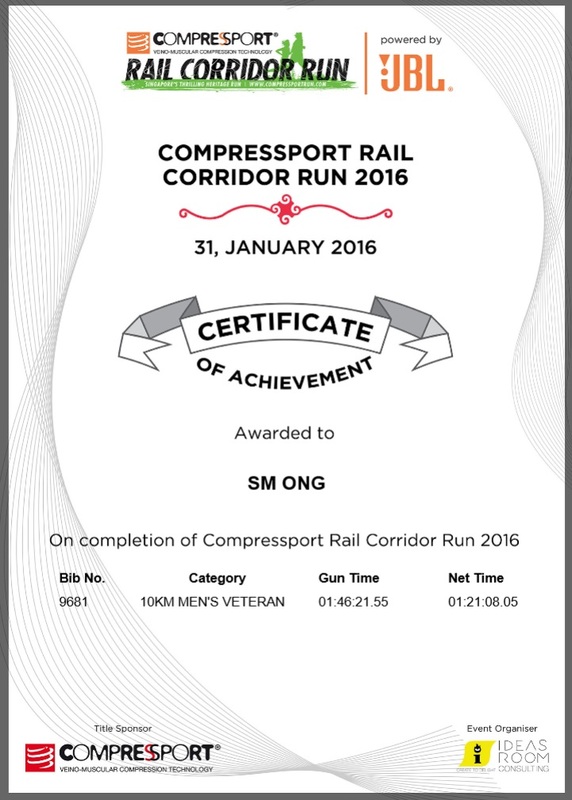 Well, I did join the Rail Corridor Run because I thought it would be a different experience from the Green Corridor Run even though it's just the same route in reverse. In that regard, I wasn't disappointed.